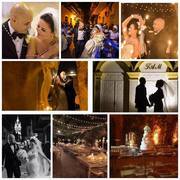 I am trying to look into a few things for my wedding in Cartagena but I cant find a email address for the church. If you had the contact information for either Santo Toribio or Igelesia Santo Domingo, I would appreciate it. I know Santo Toribio was under construction last year but hopefully it's done! Does anyone have the email for the church- Iglesia de Santo Domingo? 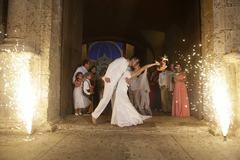 I got married in Santo domingo, I don't have the email handy, but I googled it and found it. if you live in Canada you have to do all the paper work in Canada and submit the requirement to santo domingo this will not be considered "your church". Depending on which province you live in, you will have to do the legal marriage in Canada, which is just the marriage certificate, an officiant, and two witnesses. We did it here, but just under the radar. Here is the catch with Churches in Cartagena, they might not be as networked as churches in Canada or the US. 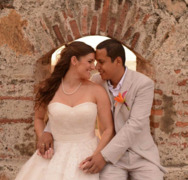 The contact we had with Santo Domingo was through our wedding planner. I have a copy of the receipt with our service payment with a phone, 664-5048. I'd say that's the best way to contact them from out of town. FYI Santo Toribio is theo nly church in the old city with A/C so the bookings are hard to get specially on weekends. Santo Toribio is beautiful. I loved that church when I went there in March It's smaller and may not require as many floral decorations as other churches. I ended up picking Santo Domingo because it was closer to my wedding venue. Here is the email for Santo Domingo. Thank you everyone for sharing the information.